Valleyview Cottage - Champagne Valley Accommodation. In the Central Drakensberg, the Champagne Valley brings you even more surprises. From the valley you have amazing surroundings, and in the distance the majestic peaks. 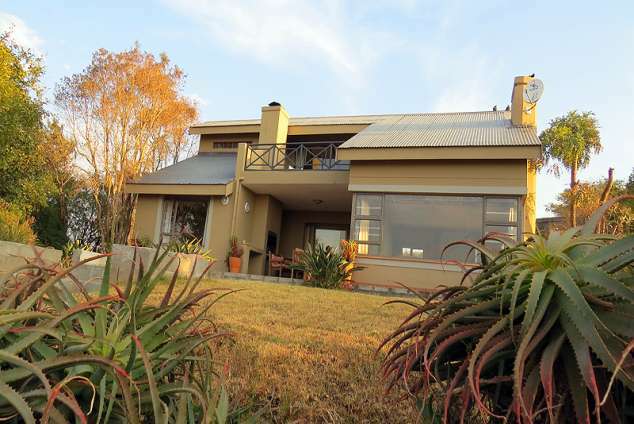 Where the valley meets the mountain, you will find Bergview Estate with Valleyview Cottage. Bergview Estate is adjacent to the Ukhahlamba World Heritage Site. The cottage comprises of a main bedroom with en suite bathroom on the first floor, and 2 bedrooms sharing a bathroom on the ground floor. The main bedroom has a private deck overlooking the valley. The lounge opens up onto the veranda which includes a braai area, all overlooking the valley. The lounge has been fitted with a fireplace for the colder evenings. Although the purpose of your visit here should never be to watch TV, we have a TV with SABC and e-TV channels available. The kitchen has all the necessities, including a microwave oven to feed a family of six. The outside boma is the ideal place to share the day's events. Covered parking is available for one vehicle. The Drakensberg Sun is within walking distance of the cottage. As a guest in the Bergview Estate, you can obtain permission to use the facilities of the hotel free of charge, pending the holiday season. 15972 page views since 13 Aug, 2014. Last updated on 07 Sep, 2018.